Creation and use of weights is fundamental to the analysis of survey data, but collection of survey data is rarely a problem-free process. Some individuals chosen for a sample will refuse to respond. Sampled individuals may not be from the target population. Groups may be under- or over-represented. Even so, we wish to analyze data from these samples and, thus, to have weights that account for these issues. 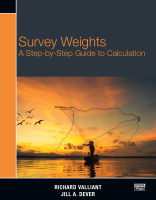 Survey Weights: A Step-by-Step Guide to Calculation, by Richard Valliant and Jill Dever, walks readers through the whys and hows of creating and adjusting survey weights. It includes examples of calculating and applying these weights using Stata. This book is a crucial resource for those who collect survey data and need to create weights. It is equally valuable for advanced researchers who analyze survey data and need to better understand and utilize the weights that are included with many survey datasets. Valliant and Dever begin with a brief review of survey sampling theory and methods, including a discussion of the purpose of weights and an overview of sampling techniques. Then, they explain each of the steps required to create weights. The first step is the creation of base weights (the inverse of selection probabilities). In the following steps, the authors discuss adjustments that can be made to those base weights to account for problems such as nonresponse and units that might not be part of the population of interest. For instance, they demonstrate how to use propensity scores and boosting to account for nonresponse. They also explain how to reduce standard errors and correct coverage problems by using auxiliary data to adjust weights via poststratification and calibration. Next, Valliant and Dever explain linearized and various replication-based variance estimators. They also provide insight into working with nonprobability samples, combining samples using composite weighting, working with datasets that have multiple weights, and focusing on quality control when creating weights. Throughout the book, Valliant and Dever demonstrate how to create, adjust, and apply survey weights using Stata. For instance, as they discuss the creation of base weights, the authors include Stata commands that select units and compute base weights for simple random samples, systematic samples, stratified samples, samples with probability proportional to size, and more. Later, when examining the use of calibration, they include examples that use svyset's new features for raking and general regression calibration. Researchers will learn about how to use Stata's survey features and will develop in-depth knowledge of weights, making them ready to create and use weights with their own survey datasets.